As the world economy becomes more interdependent and competition more global, the information technology management challenges of enabling the global marketplace must be met with innovative solutions. Covering both technological barriers and managerial challenges, this discussion includes international issues such as managerial experiences in Brazilian hotels, competition in the Asian automotive industry, e-business in Thailand, and job security in Egypt. A business-model handbook for the challenges faced by developing nations is also provided. Sherif Kamel is an assistant professor of MIS and associate director of the Management Center at the American University in Cairo. 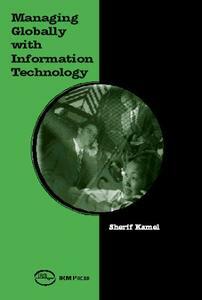 He is the associate editor of the Annals of Cases on Information Technology Applications and Management in Organizations.